Documentation screens and tests primarily used to calculate AMA Impairment ratings. 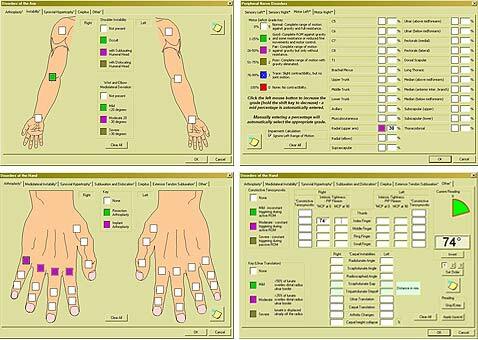 To obtain the complete Upper Extremity Impairment Rating, this software is used in conjunction with the H500 Hand Kit, R500 ROM Kit, and the ESW Upper Extremity Evaluation software. Automatic calculation of impairment saves significant time over manual methods and prevents calculation errors. Calculation of Upper Extremity Impairment using the AMA (American Medical Association) Guides to the Evaluation of Permanent Impairment (rev 4th & 5th editions). The comprehensive Impairment Report provides both the summary values as well as detailed charts and text showing how the summary values were calculated. The Impairment Report also includes the ability to use the uninvolved side as the normal for calculation of ROM and Strength impairments and the option to not print any values for the uninvolved side. The AMA Guides table and page references are included in the detailed text report.